^ Yarwood, Doreen (2011) . 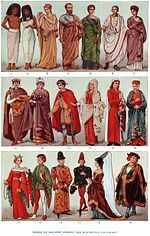 Illustrated History of World Costume. Mineola, New York: Dover Publications, Inc. p. 104. ISBN 978-0-486-43380-6.